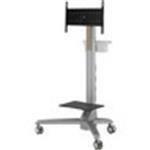 The amrm6 mobile computer or television display cart enables great flexibility for your presentation needs. no more static positioning of your tv or computer displays, move it to were you need it with ease. this amer mobile display cart supports a 600 x 400mm vesa pattern to mount tvs and other displays. the display module can be swiveled, tilted and rotated allowing creative flexibility. a device tray and storage bin are also included for organization. this system is height adjustable with a touch lift, allowing for the display to be adjusted to your desired presentation height or to aid in transport through doorways and other obstacles. a powered model called the amrm6e is available for those needing a powered lift. the tv/monitor panel support size is 32" to 65" and the tv/monitor panel weight support is 22.2 to 77.35 lbs (10-35kg). making this unit ideal for 32", 39", 40", 42", 46", 47", 48", 49", 50", 55", 58", 60", 62" and any other tv / panel sizes up to 65"